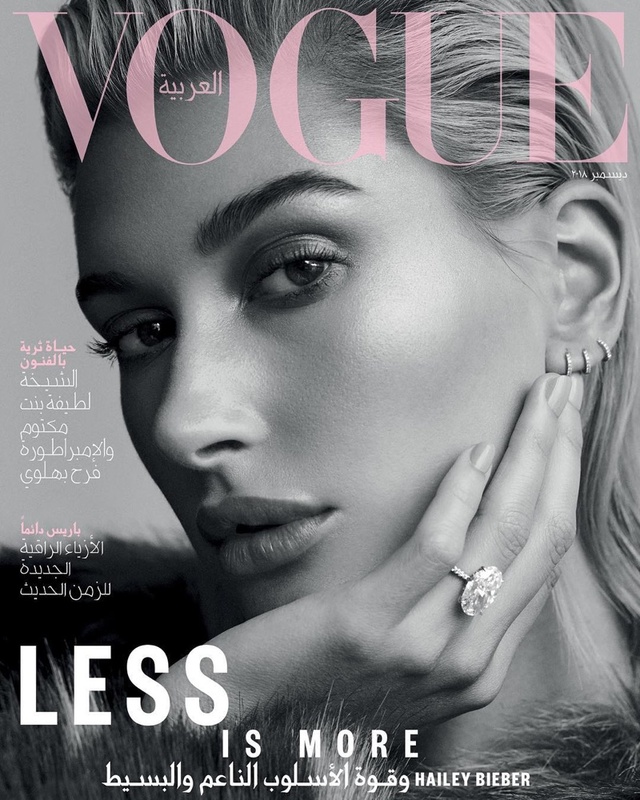 After flaunting her massive diamond engagement ring for Vogue Mexico September 2018, top model Hailey Baldwin does the same for Vogue Arabia. Posing for the December 2018 issue of the fashion publication, the newly married Mrs. Justin Bieber is a glamorous sight photographed by Zoey Grossman. Hailey, who has officially changed her name to Hailey Baldwin Bieber, poses for two covers of the publication, and for one gets a close-up shot with her impressive diamond engagement ring taking the limelight, while the other shot has her channeling Debbie Harry in a retro glam look. The face of PrettyLittleThings, talks about her love for kids and how she cannot wait to have kids of her own, though they won't be in the picture anytime soon. The daughter of Stephen Baldwin also talks about spending less time on social media and how she had a normal childhood and teenage.